I had promised that I would describe a quick ‘field-strip’ of a gearbox, in this case the one on the GTP, which is similar to all other pre-swingarm models. Actually the swingarm models are very similar and only differ in detail from this procedure. 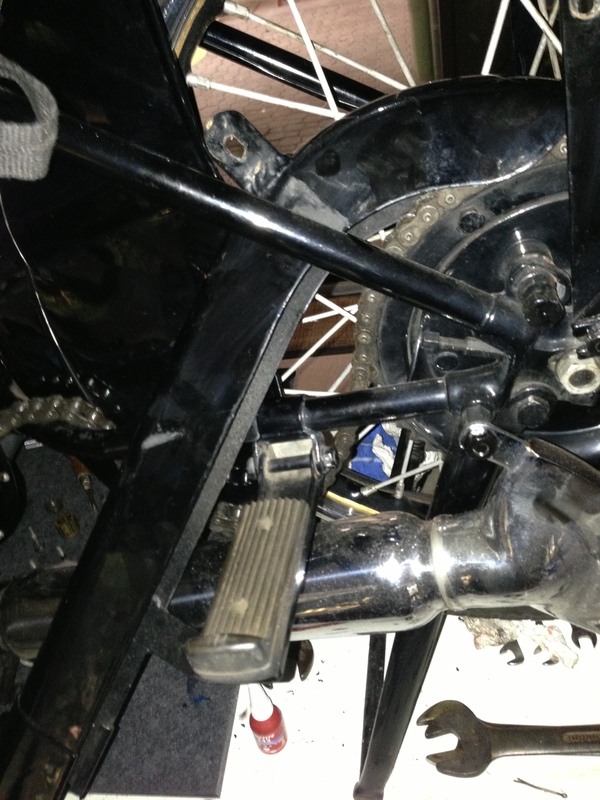 First to come off are the footrest and gear-change pedals as previously described, both because they are in the way! You might also have to remove the exhaust-pipe, depending on how it runs. So that’s about three to four nuts. It might be an idea to let the oil out of the box in a controlled fashion at some stage, now is as good a time as any, while we are undoing things. If stuck really out in the middle of nowhere, the problem arises of refilling with the old oil after replacing everything else, so it’s a good idea to scout around for a suitable container, before opening the ‘tap’. I generally have some kind of plastic water bottle for the trip anyway, but a coke or lemonade bottle will do the job just fine (I just don’t happen to drink those!!). Even dirty oil is better that none and there is usually some rubbish plastic bottle or something similar within a hundred yards or so if you don’t have your own, discarded by some thoughtful car-driver… which can be cut open on one side to accept the oil as it pours out and can be used as a funnel to pour it back in. Now we go to the drive side, because opening up the cover would allow the unnecessary ingress of dirt and dust carried by any wind, that makes a nice grinding-paste…. 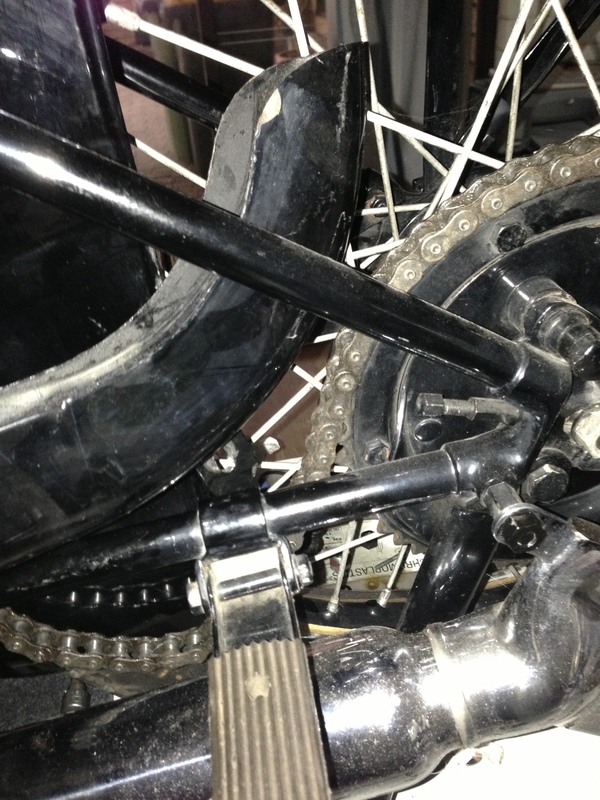 The obvious thing that has to come off now is the final-drive chainguard. To do this, disturbing the minimum, the chain first has to be ‘opened’ and secured from the ingress of dirt. 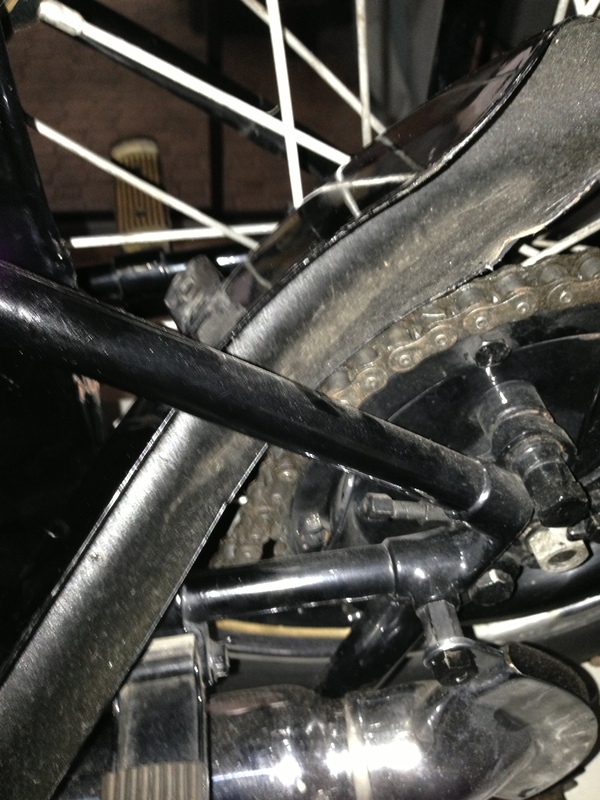 Leave as much on the bike as possible, pushing it down in the middle to hang as shown and nothing (hopefully!) will trail on the ground to pick up any crud there. 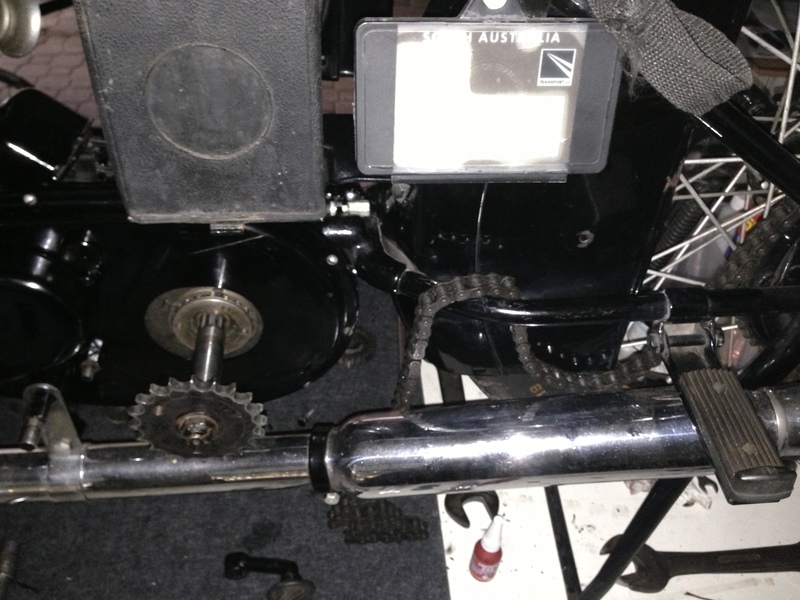 Then the three bolts holding the chainguard are undone and best put in a pocket or plastic bag (always have some small ones with me on a trip for rubbish…). Then, without disturbing the two parts that are inserted into one another (possibly well stuck together and or greasy/filthy and causing paint-chip etc) the long bit has to be ‘weedled’ out of the front. If they separate easily, then it’s not a problem , the front out the front and the rear out of the rear. Otherwise, there is a simple trick to do it without separating or damaging anything! 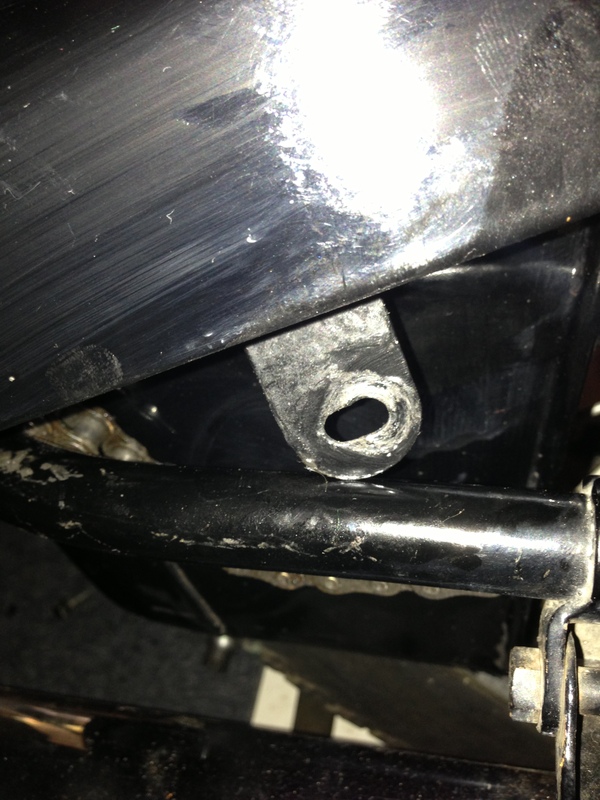 Look at the following pictures, it’s a lot easier to do than to describe: The first bit that gets in the way of easy removal is the bracket on the long section,,so the whole lot is fed over to the left and the bracket has to go OVER the frame like this. SO, what is needed here is a rotation about the long axis in an anti-clockwise direction, the bracket free to move in an arc between the spokes, leaving the open end of the guard now pointing upwards! 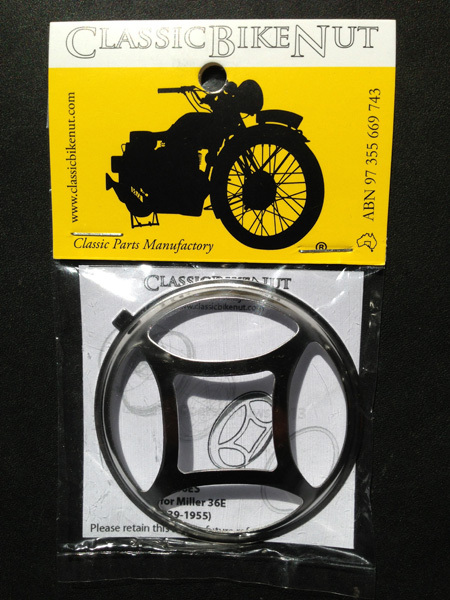 Then, following the curve of the rear portion, it is simply rotated out! Easy!! Just like baby-shampoo, no tears!! Now we can go around the other side, undo the bolts/screws holding the ‘lid’ on (not forgetting the pins and the mainshaft cover and bolt, and all can be revealed. 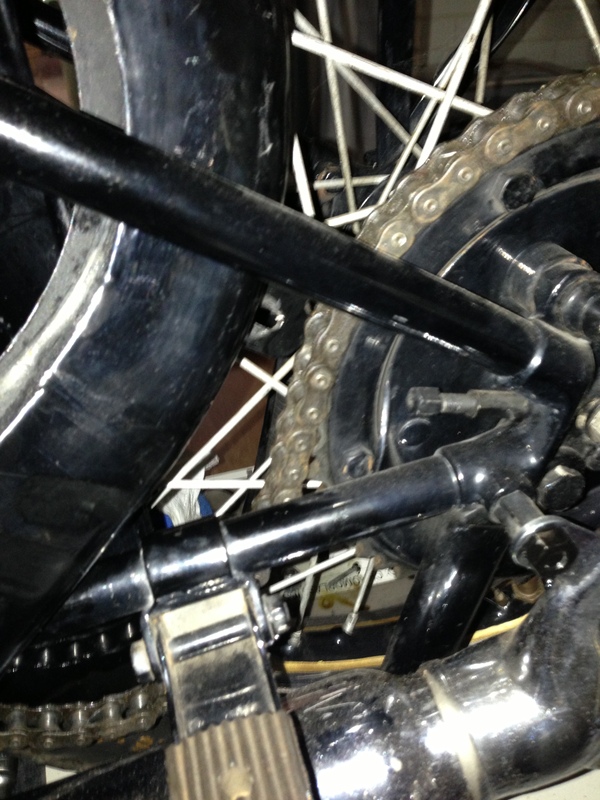 … it can also be removed (since the chainguard is already off!) from the other side, giving access to the gear-change mechanism after the gears have been taken out with the selectors , which is presumably the reason for stripping a box whilst underway in the Simpson Desert at three in the morning by torch-light, with the dingos and kangaroos watching attentively! Well, in reality, I would probably just carry on if there was a shifting-problem, as long as I wasn’t stuck in FIRST gear, which would probably persuade me to strip the box or just ‘plonk’ for the night… depending on where I was, of course! Replacement is obviously the reverse. This does not HAVE to be in the Simpson Desert, it is also possible to utilize this quick-strip in the comfort of your own garage or workshop… REALLY! Next up, Pud came and picked up the bike, and brought his picture album with him, with the before and after photos of the bike as he received it in 1970 after paying £20 for it… I shall be showing those in the next few days, too!